From the Editor: Who Will Share Our Vision? This season, I put into use what is only my second pair of Klondike mittens from Sterling Gloves. The first pair lasted me somewhere between eight and ten years. Over that period their lining wore thin in the area of my finger tips, but their soft leather shell never wore through or became stiff and dried out. And those mittens never failed to keep my hands warm. They'd still be in service today if an overly exuberant dog hadn't administered what proved to be a fatal amount of damage to the shells. For me the design of a mitten is critical if you wear a parka. 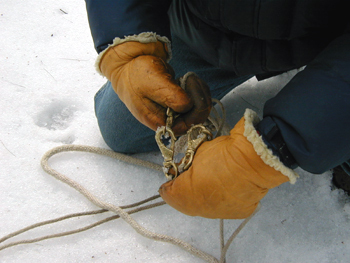 Mittens with long, stiff or long and stiff cuffs tend to be forced off your hands by the sleeves of your parka, and that's no fun at - 40ºF/C. Sterling offers a number of mittens whose designs I find ideal for cold weather activities. They have soft, short cuffs and the leather is soft and supple, which restores a fair amount of the dexterity normally lost in mitten use. The lining of my mittens is a deep pile, acrylic fleece. We could debate whether a natural fleece lining would be warmer, but I know that my Klondike mittens have never failed me on numerous Arctic trips on which they were my only hand protection. Do I like them? As soon as I had the opportunity to purchase another pair I did exactly that. And Sue got herself a pair as well. She needed a smaller sized mitten than was locally stocked. Sterling doesn't sell direct to consumers, but their Customer Service team worked with Sue and a local retailer on a special order pair. In fact, Customer Service went so far as to go out on the shop floor and discuss the sizing of the mittens with the person who actually cuts out the leather patterns to ensure Sue got the right size mittens. Sterling Gloves has been in business since 1947 and has a reputation for producing a quality product. If you visit their website you will discover they manufacture a much wider product range than just mittens and gloves. 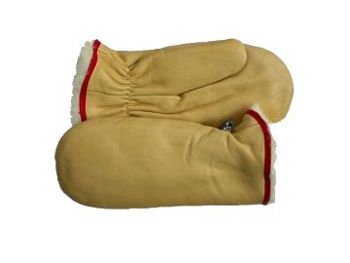 Our only experience is with their mittens but our satisfaction with them is such that if we needed any of their other products, we would have no hesitation in purchasing them. The Sterling website allows you to send an email to their Customer Service team. As you no doubt determined earlier in this review, we found them very helpful with both identifying local retailers and with size selection. This is one company that truly has a Customer Service Departmant. Sterling Glove Co., Ltd., 165 Selkirk Ave., Winnipeg MB, Canada, R2W 2L3; Phone: 204-586-8189; FAX: 204-582-2992. Website: www.sterlingglove.com, Email: info@sterlingglove.com. Is there a useful product you'd like to tell everyone about? Email your experience to mail@thefanhitch.org or snail-mail it to Mark Hamilton, 55 Town Line Road, Harwinton, CT 06791, USA.